For medical gas equipment in North Carolina, contact Lewis Systems Inc. We can provide you with the safest, most reliable medical gas equipment and medical gas pipeline equipment available on the market. 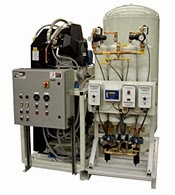 Whether you require air delivery systems for a lab, hospital, healthcare facility, or surgical center, Lewis Systems can provide you with the dependable quality medical gas systems you can rely on. As a Powerex partner, Lewis Systems provides you with NFPA-99 compliant systems in a variety of sizes and easy-to-maintain configurations that are quiet, space saving, and energy efficient. Powerex rotary scroll designed compressed air systems offer vibration-free operation and continuous 100% duty cycle. Powerex medical desiccant dryer removes moisture and contaminates while delivering treated air exceeding the specifications for NFPA 99 Category 1 medical air. Lewis Systems also offers Tri-Tech medical gas pipeline equipment in North Carolina providing an extensive lineup of medical gas systems with value-added benefits such as time savings, increased safety, and reduced costs. Tri-Tech’s innovative products range from high-tech alarm panels, medical gas outlets and manifold systems, specifically designed for medical and healthcare applications. In North Carolina, contact Lewis Systems today for more information about our medical gas solutions and pipeline equipment.